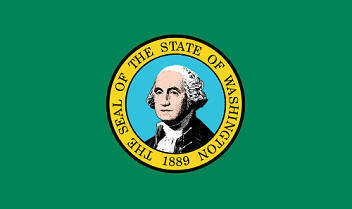 The State Flag of Washington is a unique green field (background) and depicts an image of the first US President George Washington. The name of the state is detailed on the gold outer ring together with the date of statehood, 1889. The Washington flag serves as a symbol of honor, heritage and regional pride and is displayed at state buildings. There is a strict Order of Precedence for flags. State Flags are displayed in order as they entered the Union. Car Flags are often displayed to represent of an individual's allegiance to their state. Washington State car flags are used by their owners as mobile emblems of their home. Car flags are usually made from strong materials and are attached to a car via a pole and clip window attachment. What is the design of the Washington state flag? Who designed the Washington State Flag? What is the history of the Washington State Flag? The first flags were those used by military regiments showing the profile of the President set against a blue background. Another design, featured the image of the seal in gold in the middle of either a green or purple background. The Washington flag is kept and used as required by the code specified in the constitution of the state. The man who bravely led his troops during the Revolutionary War of Independence (1775–1783) had a personal flag designed in 1775 which he flew throughout the war. Images of the flag are captured in two paintings, whose content was verified by eye witnesses. The names of the paintings featuring the Personal Flag of George Washington are "The Battle of Princeton" by William Mercer and the "Surrender of Yorktown" by Van Blarenberghe. This pictures depicts the personal 'Old Glory' flag of the great man, designed in 1775 first flown during his winter encampment at Valley Forge. His flag was carried by his personal protection squad called the "Life Guard". It displays 13 large white stars in a 3-2-3-2-3 pattern on a blue background. The original stars were six pointed, sometimes referred to as Marian Stars, and symbolized honor, achievement and hope. (The Great Seal of the United States also contains a six-pointed star made up of 13 stars, representing the original 13 colonies). The five pointed stars were not used until 1784.